I've been on somewhat of a Rainbow Honey binge recently. It's all I've really been buying as I've curbed my spending habits quite a bit! Then again, Rainbow Honey polishes are just amazing and I pretty much have to have them every time more are released. I picked these up a while ago from Rainbow Honey's website. They were featured on Fab.com for a while, but I managed to snag some from the remaining stock that was put on rainbowhoney.com. 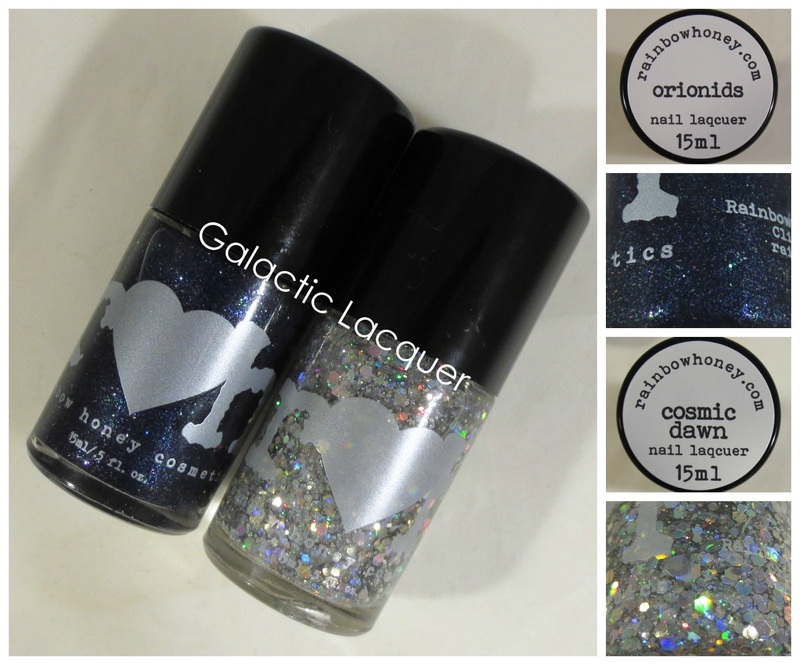 Each set came with three polishes, but I mixed them up a bit - Orionids is from the Shooting Star set and Cosmic Dawn is from the Cosmic Dawn set. Orionids really grabbed my attention first out of all six. I'm typically drawn to blues and greens, so it's no surprise. Orionids is very unique though. I would describe it as an indigo polishes with flecks of blue, purple, and green. Alone, it almost looks like outer space! But I still topped it with Cosmic Dawn for some added bling on an accent nail. 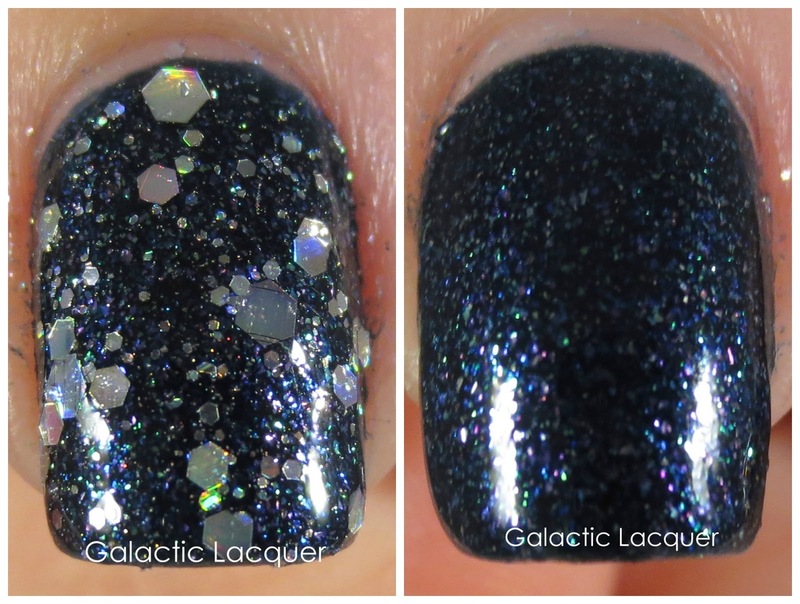 Cosmic Dawn is an amazing glitter topper too. I've seen my fair share of silver holographic glitter suspended in a clear base, but this one is seriously unlike any other I have tried. I applied one generous coat of Cosmic Dawn and got plenty of glitter on my nail. The large holographic hexes really catch the light. It almost looks like I have diamond rhinestones on my nail! As for Orionids, it's a little thick, but workable. I find that a lot of Rainbow Honey polishes tend to be pretty thick, but I sort of like it. This way, it only took two coats to reach full opacity, and I got plenty of shimmery flecks too. You can see how the holographic glitters shine so much that they reflect rainbows onto the other nearby nails. I love the stark contrast between the deep indigo of Orionids and the bright silver of Cosmic Dawn. Photos can't really do either of these justice! They're absolutely amazing polishes, and they really catch the light. I'm surprised Orionids shimmers so much since it's so dark too. Unfortunately these two polishes are now sold out, but Rainbow Honey has been talking about bringing back some of their past limited edition polishes... 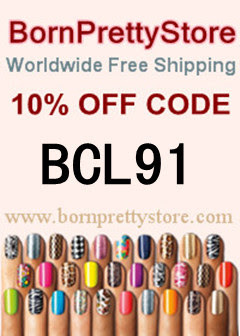 Otherwise, you can always find other great polishes from Rainbow Honey on rainbowhoney.com!